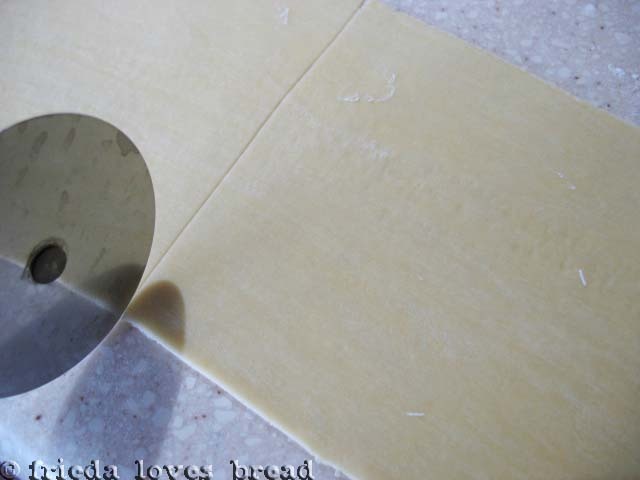 Frieda Loves Bread: Fresh Pasta! Easy as 1 ~ 2 ~ 3! 21 Fresh Pasta! Easy as 1 ~ 2 ~ 3! Do you LOVE pasta? I do! After my MANicotti post, some of you asked about making fresh pasta. Dried pasta is good. Fresh pasta is extraordinary. It is simple, easy, and inexpensive to make. Think about your favorite restaurant. Like bread? Salad? Pasta? Why pay $15 for a dinner salad, bread or pasta when you can make it for pennies on the dollar? It is easy as 1 ~ 2 ~ 3.
eggs and a dash olive oil. You can mix this by hand or machine. 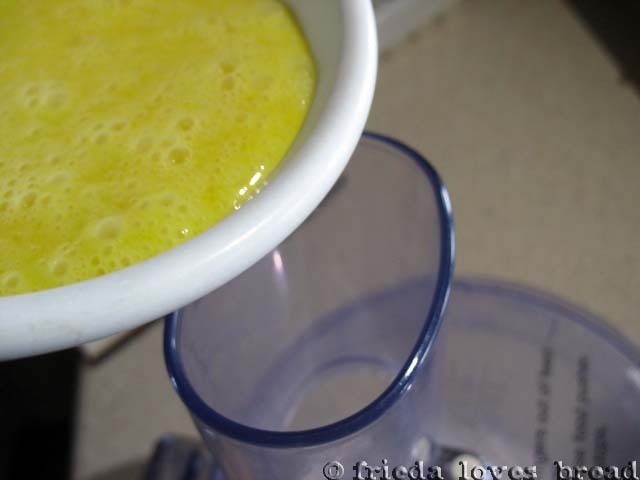 This dough needs just a wee bit more moisture, so I add about a tablespoon of water. 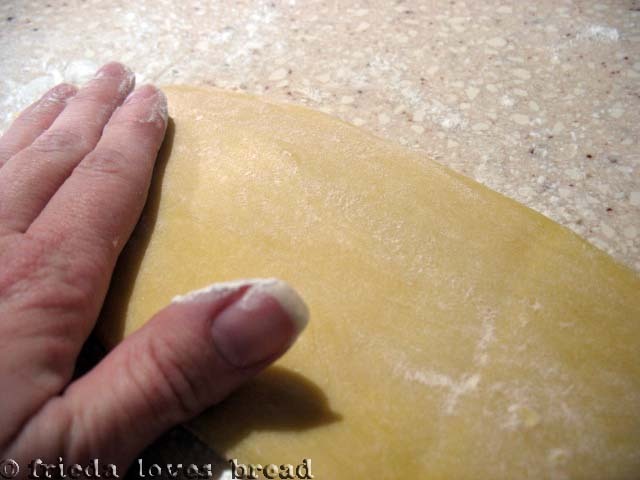 Give it a quick knead on the counter until it is smooth. Cover it with plastic wrap and let it rest for at least 30 minutes. 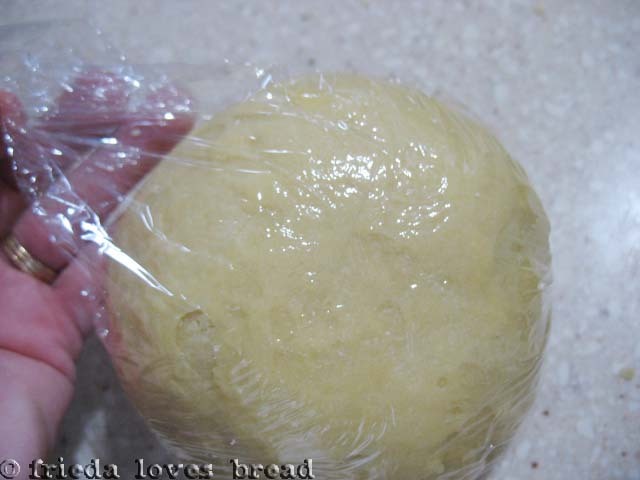 The flour will continue to absorb the liquid ingredients, become softer and easier to roll without tearing. add the hand crank, and you are ready to go! 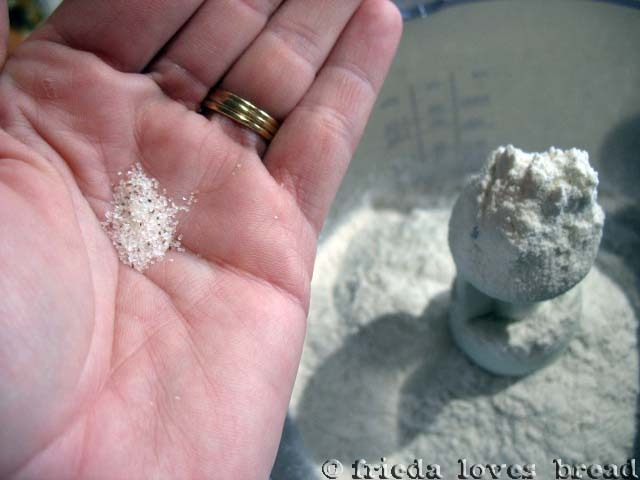 Each side of the dough is dusted with a little bit of flour. 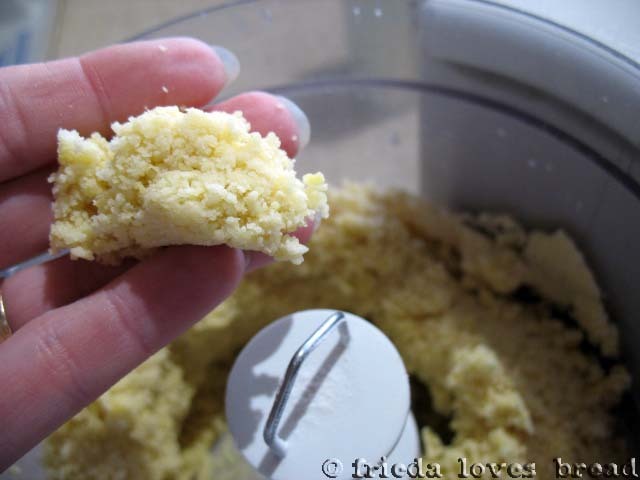 Brush any excess flour off. The knob has the numbers 1-7 on the dial. We start with number 1. 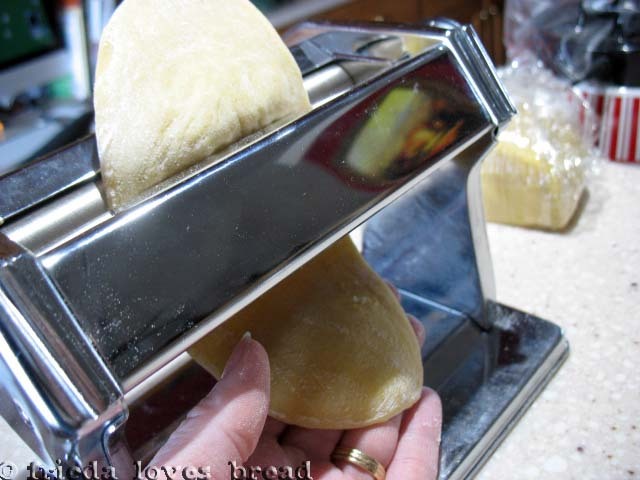 Pass the slice of dough through the machine...No need to pull it through...just guide it out onto the counter top. and repeat: dust, turn knob, crank. 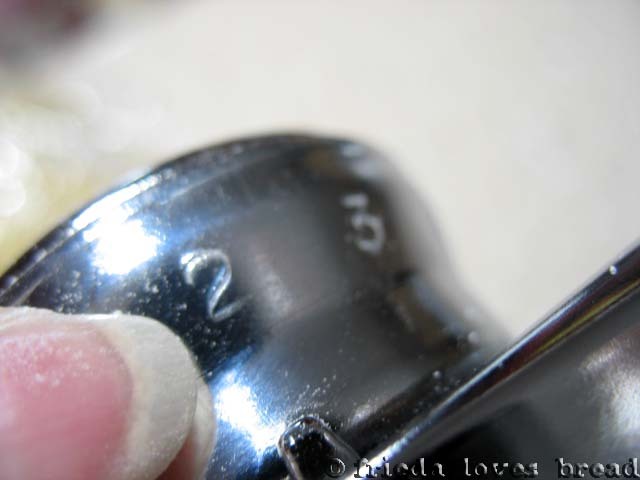 Dust, turn, crank....till you reach your desired thickness. Or thinness. This goes very, very quickly if you have a volunteer crank it for you. 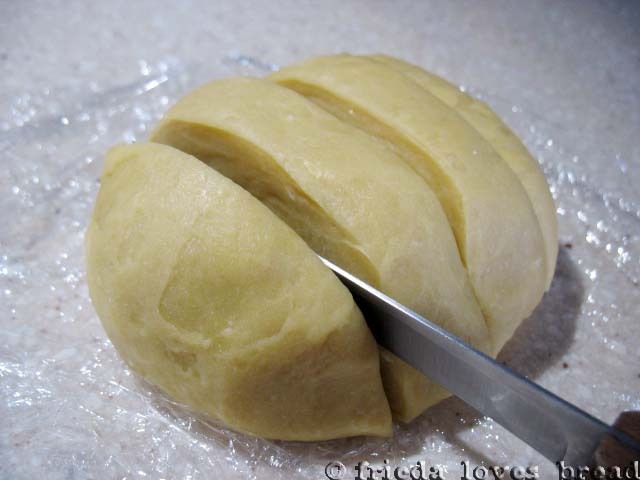 Cut the dough to the desired length. Now it is perfect for lasagne or even manicotti. 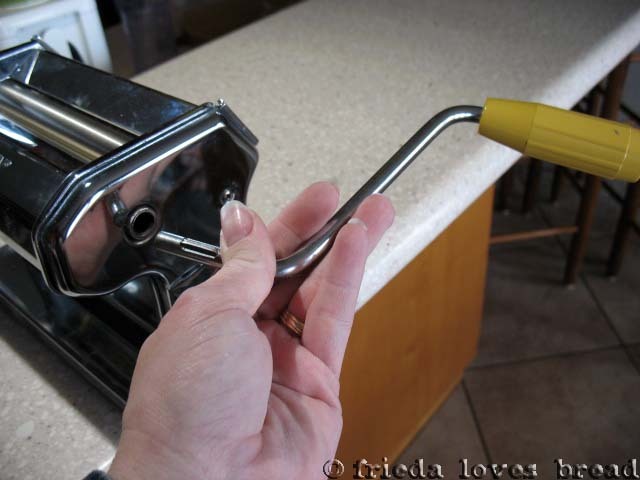 To make angel hair pasta or fettuccine, connect the attachment to the pasta maker and move the crank to the type of pasta you wish to make. This attachment came with my pasta machine. Dust the pressed pasta sheet one last time lightly with flour. Brush the excess off and put it through the cutters. ...and the angel hair pasta! Since I am cooking the pasta right away, I put them in small piles. I've dried pasta before and it takes for...e...ver. Really. A day or two, depending on the thickness of the pasta. Besides, FRESH is better! Pssst....did you know you can freeze the dough? Just put these piles of pasta on a baking tray and stick them in the freezer for several hours. Once frozen, put them into a freeze Ziploc baggie for longer storage. When you want to cook it, take it straight from the freezer and add 1-2 minutes of additional cooking time...no thawing out needed! To clean the machine, all you need to do is brush the flour off. That's it. 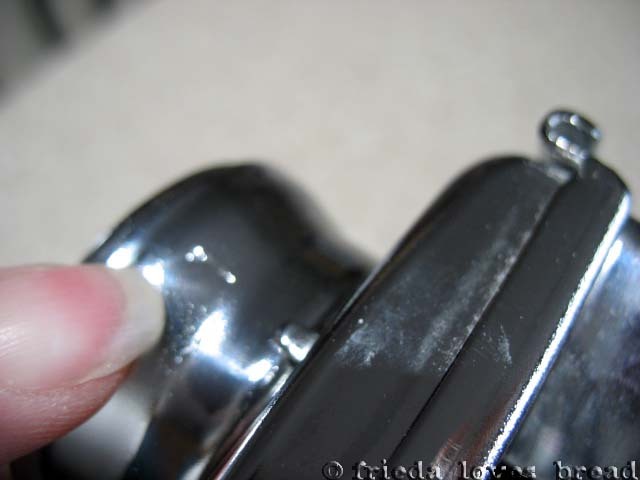 No soap, no water, no dishwasher. Easy! 3 ~ Cook your pasta. Fresh pasta cooks up very, very quickly. Like, 1 1/2 - 2 minutes. Just give them a quick stir after putting it into the boiling water and the noodles will magically come apart. After 2 minutes, scoop the pasta out, put it into a bowl, and give it a quick toss of olive oil or marinara sauce to coat the noodles and keep 'em from sticking. 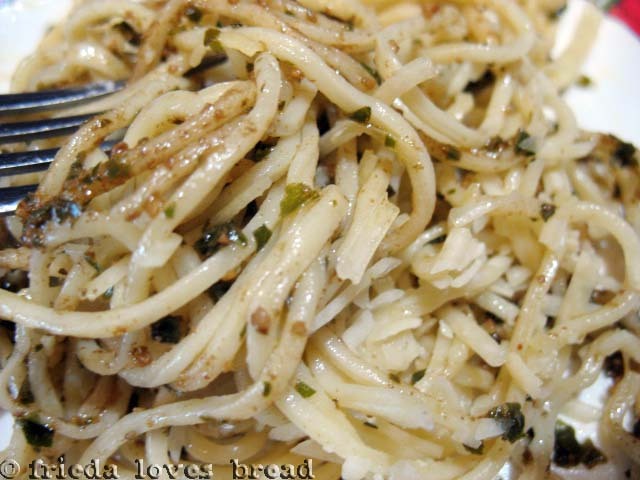 This angel hair pasta is my hubby's favorite, tossed with pesto that I made last year and froze in ice cube trays. Are you ready for fresh pasta? And now I want a pasta cutter, I fully blame you for this. 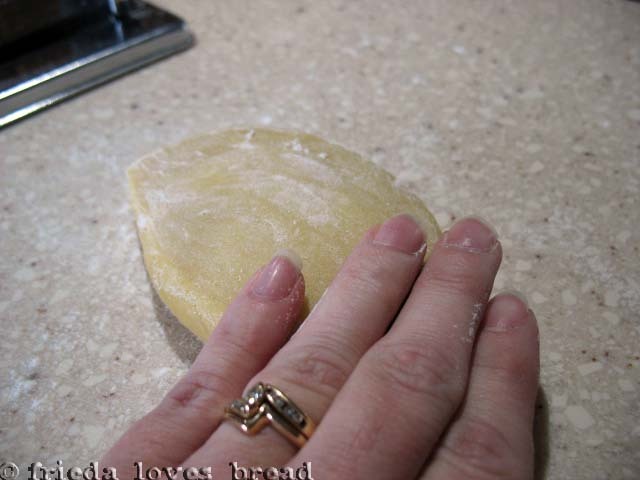 I made handmade/homemade pasta once. It was the best pasta I've ever tasted! I didn't know you could freeze it though. Definitely easier than drying it. Hmmm, this pasta looks really good. I agree that Freshly made pasta is the best especially since you an adjust your ingredients to your taste. I agree with you, fresh pasta is beyond any comparison. You made this pasta really good Frieda and the dish looks extraordinary! oh my word this looks DIVINE!!!! i want pasta and it's 9am. I'm a fiend for pasta and would love to make my own. You make it look so much less daunting. 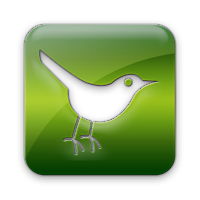 I can't wait to finish browsing through your amazing blog. I just made my first sourdough starter and a couple of different kinds of bread from my starter and am looking for different kinds of bread to make! Wow. You make that look so easy and so wonderful! Wow! 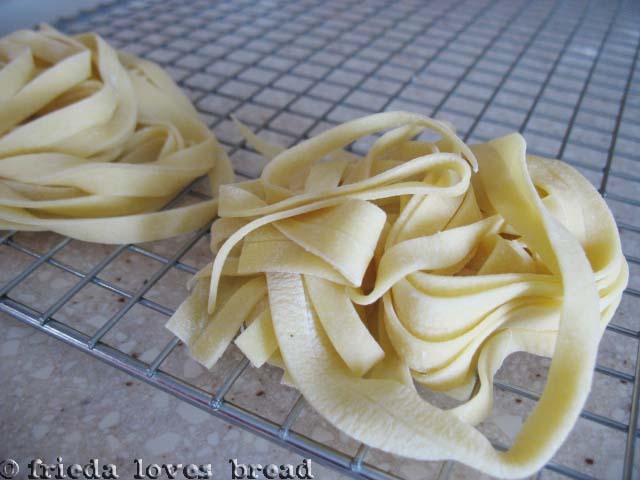 Homemade pasta is probably as good as homemade bread! I love pasta but never thought of making it on my own. You did a fantastic job and I enjoyed reading the procedure one by one! 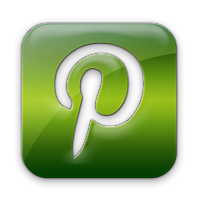 Thanks for sharing and it was a great post! 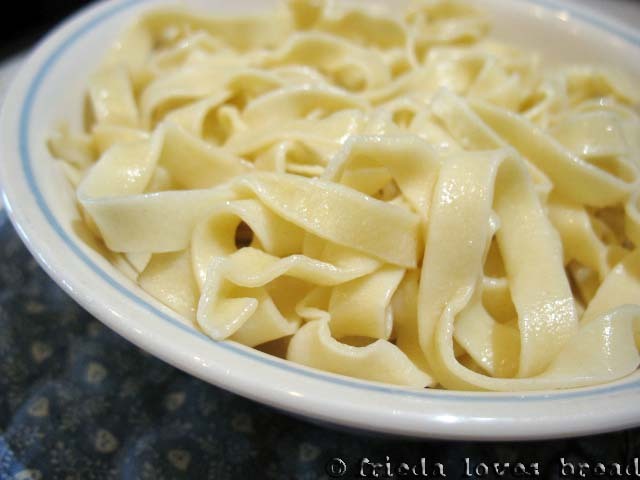 I've been wanting to make fresh pasta, and this post is SO helpful!! I really appreciate you taking the time to document each step, thank you! 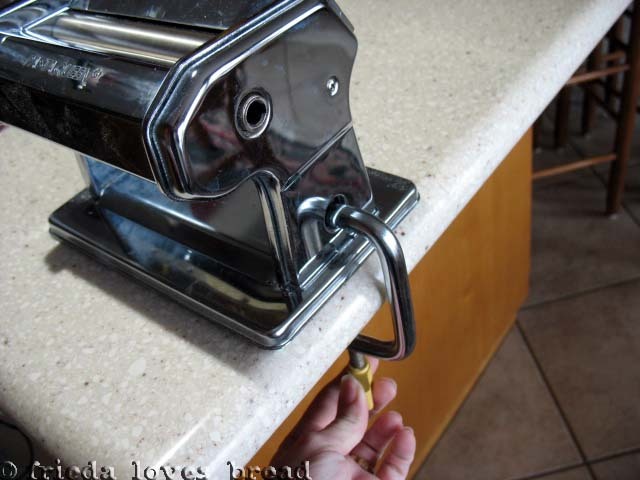 OK - now I want a pasta machine! Frieda, do you have a favorite flour you use? Katie, my favorite flour is unbleached all purpose flour from Lehi Roller Mills. My second favorite is whole white wheat, freshly ground. I do hope you get a pasta machine! 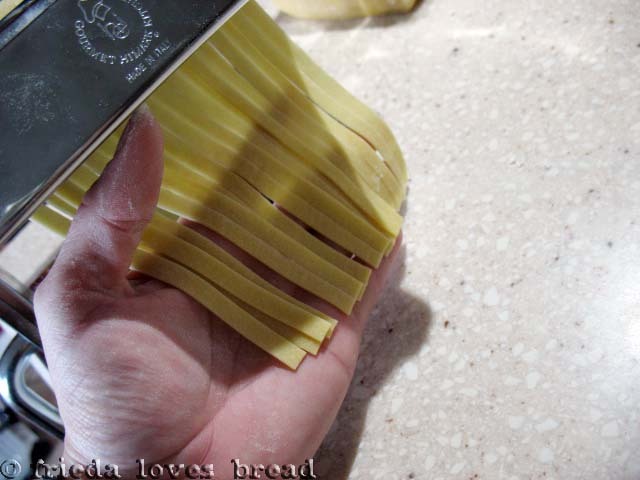 Thanks for a step by step guide to homemade pasta. I tried a recipe once before but it was too thick. I also don't have a pasta maker but plan to purchase one for Mother's Day (hopefully). Thanks for pasta inspiration! I bought an Atlas pasta machine 25 years ago. I've only used it a handful of times. I think I must get it out again. And I'll for sure try your recipe. Thanks for the great tutorial. Oooooh! I bought the same exact pasta machine you have at a yard sale a few years ago. It didn't have any instructions and I just played like I knew what I was doing and the pasta came out good, but you just made it tons easier for me! Looks fabulous. Now I want to buy a pasta machine. 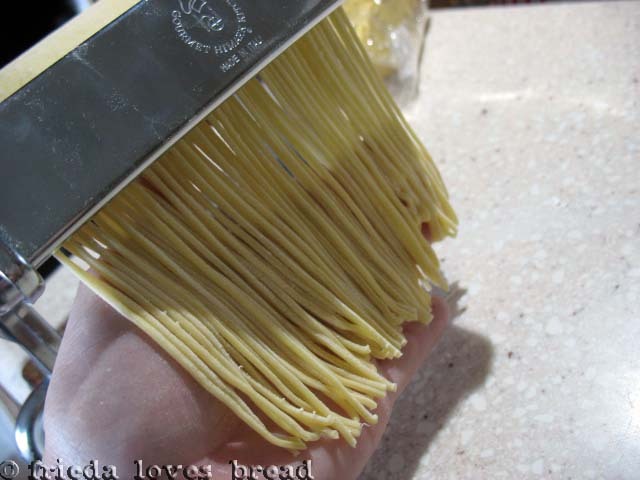 You just inspired me to make my own pasta. Now I just need to get me a pasta maker. Thanks! LOVE this post! I've been wanting to make ravioli but haven't had the courage! I think that'll be a project for this weekend! Love, love ,love PASTA!! !,Thanks for promoting homemade, most don't know how easy it is.If possible find a source for semolina flour, I get mine at a health market that sells bulk grains and flours, it makes a world of difference in the pasta. Oh, My! I really need to find my pasta maker! It's been way to long since I made fresh pasta, and it sounds so good. Wonder if the local store has semolina flour, was thinking of ordering some durum wheat berries and making my own. It's so hard to find supplies here for things like this! This looks like a lot of work. I fear the cost of getting into this would offset the benefits? No? How do I test this theory...buy fresh pasta somewhere first? I'm torn. 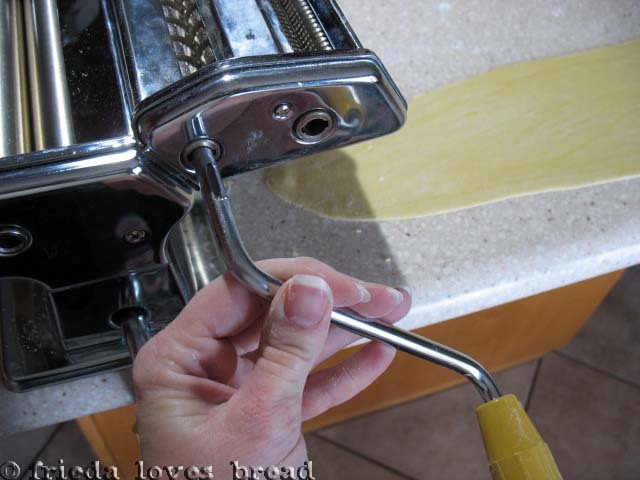 thebtis, it doesn't feel like a lot of work...the rolling by machine is much faster than doing it by hand...yes, store bought pasta is faster and easier, but fresh pasta tastes sooooo good! I think you pay a premium for fresh pasta, so if money is no object, go ahead ~ enjoy! 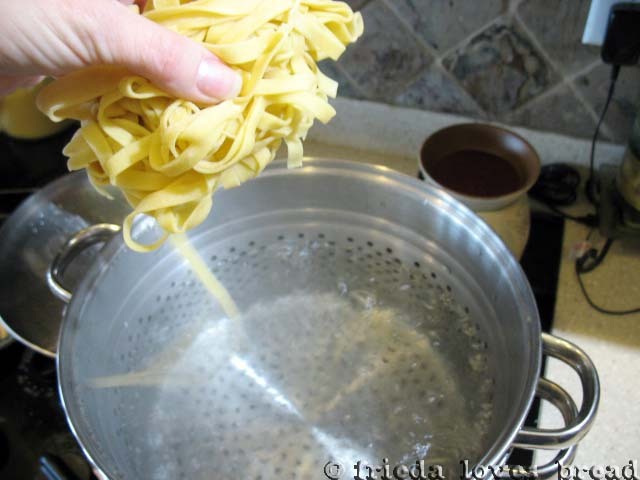 I'm finding there are other uses for a pasta maker, so stay tuned!